Kieran was born in Bristol, England and moved to Burlington, Ontario at a very young age. While in high school he participated in numerous sports which sparked his interest in pursuing a career in sports injuries. 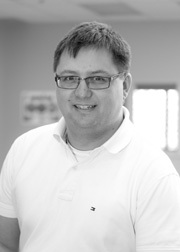 He graduated from McMaster University with a Bachelor of Human Kinetics, a Diploma in Sports Injury Management from Sheridan College and a Diploma in Osteopathic Manual Practice from the Canadian College of Osteopathy. Kieran has worked with many levels of athletes and sports teams including the Canadian World Cup Soccer Team. He has provided a number of sports safety lectures for various running clubs and other community base sports teams. Kieran is a big fan of all sports and enjoys helping people achieve their rehabilitation goals, personal goals and fitness levels.